1. Take it to the Water! It’s very important to relax your muscles before movement takes place. A relaxed muscle moves quicker and with more fluidity than one that is tense. 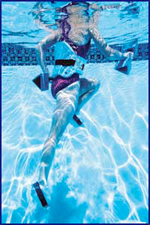 Whether you are on land or in water, controlled flowing movements is your goal. Take advantage of the water medium to relax your muscles before and during movements. The feeling of weightlessness allows you to move freely and quickly. Since your legs aren’t bearing any weight, it’s easy to relax through the entire running stride. This stress free movement should help you develop a more relaxed and fluid stride on land. Movement through the correct range of motion and in a linear direction is as critical when you’re running in the water as it is on land. Your range of motion with your legs can be greater in the water because there is no impact with the ground. Once you’ve mastered relaxation and range of motion, focus on your rhythm which is the result of coordinating the upper and lower extremities as you move through the water. Start slow and get the feel of this rhythm. Once you have it mastered, build up speed. The rhythm should feel much like it does on land. The weightless atmosphere, however, allows movement in slow motion through the complete range of motion and also allows you to focus on one leg at a time. Speed of movement is directly related to effort in the water. The faster you go…the harder you will be working.